Thanks for the add. I have had a 73 convertible for about 20 years. Love driving the car but want to put it back to an original appearance but modify the drive train. Would like some guidance. 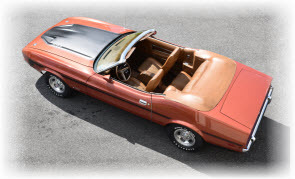 Haven’t found much information on 71-73 Mustangs. Current stable includes a 67 candy apple red convertible, 70 grabber green Mach1, medium copper 73 convertible, mineral gray 02 GT, and a silver 09 convertible. (07-16-2018, 07:24 PM)73conv Wrote: Thanks for the add. I have had a 73 convertible for about 20 years. Love driving the car but want to put it back to an original appearance but modify the drive train. Would like some guidance. Haven’t found much information on 71-73 Mustangs. Current stable includes a 67 candy apple red convertible, 70 grabber green Mach1, medium copper 73 convertible, mineral gray 02 GT, and a silver 09 convertible. Welcome! I'll be glad to help having done a few 73 verts, including recently a fully loaded Medium Copper vert. Also, I am about to start the restoration of a Calypso Coral 70 M-code Mach 1, so I may need your guidance with it, since you have one of these too. Welcome from Iowa. Quite the stable you have there. Howdy and welcome from Seattle. Post some pics! Welcome from San Diego. This is the place for all your 73 project questions. Welcome from the Netherlands! Nice collection of cars you have!